Step inside one of downtown Napa's hidden gems: an urban winery that now includes a nano-brewery, where the hops are grown on site. If the explosion of beer-making in America has cornered beer producers into two camps—the IPA stalwarts trying to out-hop the next microbrewery, and the classicists who gravitate toward freshness—brewmaster and winemaker Elaine St. Clair, belongs in the latter. The Napa local thinks the hops craze has gotten out of hand, so she decided to get back into brewing to “reign in” that style and find more balance. Enter her nano-brewery, which she opened earlier this year in her downtown Napa-based urban winery. 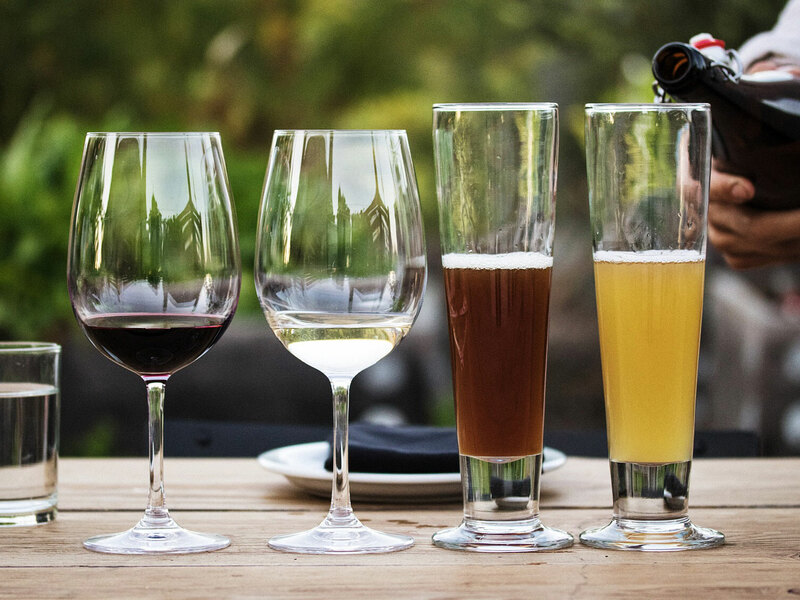 The brainchild of co-founders St. Clair and Laina Brown, St. Clair Brown Winery is one of Napa's most exciting hidden gems—a four-year-old winery and now beer garden that merges estate wines with flights of beer, as well as dishes made with ingredients grown in an on-site garden. Every week, beginning on Thursday night, a steady flow of regulars—many of whom are local winemakers and microbrewers themselves—converge for happy hour at St. Clair Brown, where the taps keep flowing through Monday. It's something of a local secret, and thanks to the new beer program, it's a better time than ever to get in on the action. St. Clair approaches beermaking like she does winemaking, looking for layers of nuance, flavors and complexity. She even grows her own hops right on site—eight different varieties for various aromatic qualities, from spice to citrus. By all accounts, she has achieved what she set out to do, brewing beer that is balanced, diverse, and fresh in a scene where intensely hoppy brews still dominate. 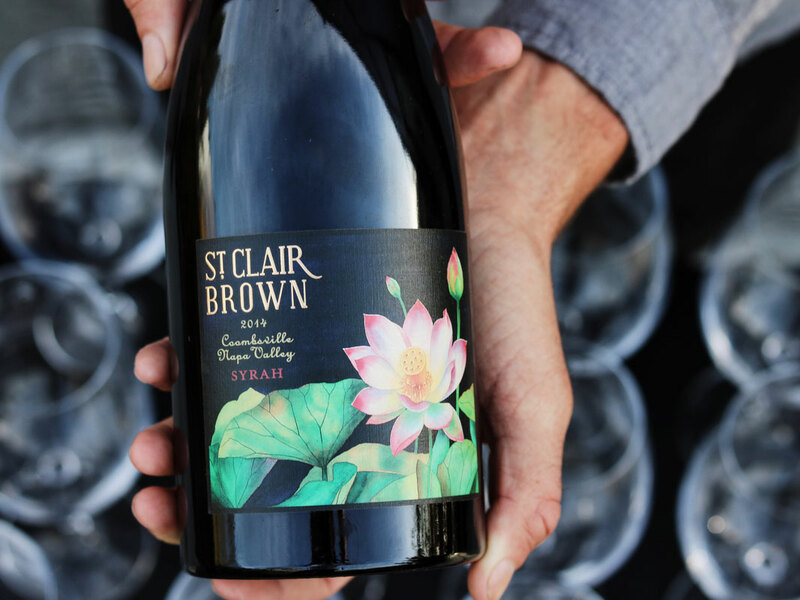 I met St. Clair and Brown on a recent afternoon in their Greenhouse Tasting Room, situated across the street from the winery and brewery, where open-air seating is surrounded by an impressive array of fruit trees and aromatic herb and vegetable gardens. Eventually, the plants will grow so dense it will feel like a secret garden—only with exceptional wines and beautifully balanced beer to accompany an ever-changing menu of bites derived from the garden’s bounty. A UC Davis grad with a BS in Fermentation Science who previously made wine at Domaine Chandon and Domaine Carneros, St. Clair has an equal passion for beer as she does for wine. 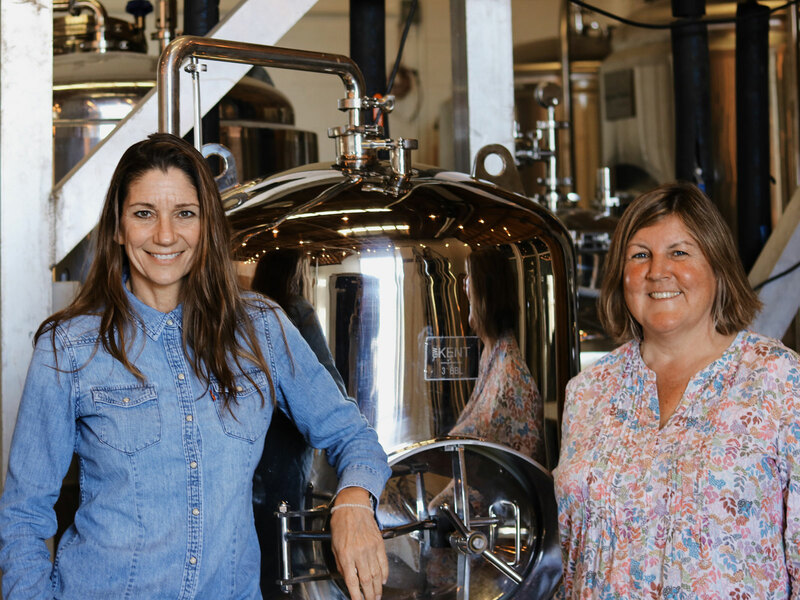 She became a co-owner of Napa Ale Works, where she was the head brewer for a decade before it sold in 1998. Her family also owns the St. Clair Family Vineyard in Coombsville, which is a source for the Syrah wines she produces under the St. Clair Brown Winery label. Her partner, fashionista Laina Brown, once owned a clothing line, but after a decade of the fast-paced fashion world, settled in St. Helena, CA to raise her family. When the two met at Domaine Carneros a number of years ago, there were few places for locals to relax in downtown Napa. So Brown and St. Clair set about creating their own, which is how their urban winery and most recently their beer garden came to be. The duo boasts perfectly complementary talents. “Elaine makes it all [wine and beer] and I can take it to the world,” Brown says. “That’s awesome for me because otherwise, I would just be making all this stuff and it would be collecting somewhere,” St. Clair laughs. They've chosen to keep production limited to a small scale. For now, that means roughly 1,800 cases are produced annually (1,000 cases of wine and 150 barrels of beer) divided between 11 wines and 13 beers. “Our beers are essentially made to order, and super fresh. They go from this production room, right across the street to the greenhouse. And because we’re such a small operation, I like to experiment a lot,” she says. The food menu, meanwhile, is inspired by what St. Clair chooses to grow, and is designed to pair with their wine and beer. Julia Scannell, formerly of C Casa at Oxbow Market, leads menu development through her company called Hive Napa, using ingredients from what is grown onsite. The greenhouse tasting room is surrounded by some 30 fruit trees including apples, pears, pomegranates, six types of fig trees, peaches plums, and nectarines. Their garden consultant is a friend, Peter Jacobsen (of Jacobsen Orchards in Yountville, CA), who farms for Thomas Keller’s The French Laundry. While most of what St. Clair Brown offers is available primarily on location (they make so little that it often sells out quickly), they do offer a wine club, beer club, and uniquely, a combination club online through their website. Whatever they haven’t sold through completely in the tasting room is also available for purchase in their online store. When next you find yourself in Napa, plan a visit. Located at 816 Vallejo Street in Napa, California, the Greenhouse Tasting Room is open to the public Thursday through Saturday, from 12:00 p.m. to 8:00 p.m. and from 12:00 p.m. to 6:00 p.m. on Sunday and Monday. Below are tasting notes from my visit with Elaine and Laina. Honey ferments with the wort and an English Ale yeast delivers an incredibly creamy and layered texture with bright citrus, orange peel, and stone fruits. Made with a combination of German and Belgian hops, citrusy, fruity with a distinct clove note that comes from the Belgian yeast. St. Clair adds dark roasted malt for a richer mid-palate feel to balance with the bitterness of the hops. Rich flavors, spicy and layered with pine, baking spice, orange peel and crushed hazelnut flavors. Clean and dry. Like an Irish red style. Medium-bodied, not too hoppy with nice caramel malt—lighter and a bit more complex and your typical Irish ale. Aromatic and flavorful with stone fruits redolent of apricots and peaches. Pumpernickel nose and nutty. Dark roasted nuts and subtle cocoa finish. Roasted herbs. “This is my wildest beer,” says St. Clair with a bit of a smirk. A Library Selection made with a French farmhouse yeast. Hops were picked last August, and this is typically available during harvest time. Spicy and citrusy, creamy and fresh. Aged in French burgundy barrels. Bright and clean with nice fresh citrus and subtle toasted oak notes and a terrific caramel finish. Produced from an old Went clone of Chardonnay from Coombsville AVA. If you love Chablis and Montrachet you’ll love this. Dark fruit with bright raspberry and bright florals, giving way to sumptuous dark fruits, clove, red currants and blueberry compote on a baking spice-tinged finish. Beautifully integrated oak gives this almost “aged violin-like" quality, to quote St. Clair. The Syrah hails from the St. Clair Family Vineyard, where it was planted in 2000 in the south end of Coombsville, neighboring Caldwell Vineyard. Bright, jammy red fruit and cinnamon spice notes. Juicy raspberry notes, milk chocolate and dark stewed plums. Bright and food friendly. From a small vineyard at the base of Mount George in Coombsville. Lovely savory notes mingle with red and black fruit, red florals and dried tobacco spice. Red currants, orange peel and orange blossoms. Just a subtle hint of sweetness with nice herbaceous notes and whispers of licorice.